We Represent & Protect our Buyers at NO CHARGE to Buyers! Congratulations! 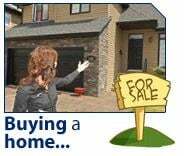 You have decided to purchase a home or property, or are thinking about buying one. You'll be joining the ranks of millions of people who realize that home and/or property ownership can offer a number of benefits including building equity, saving for the future, and creating an environment for you and/or your family. When you own your own home or property, your hard-earned dollars contribute to your mortgage. The equity you earn is yours and not the landlords. are just curious -- call or e-mail anytime! E-mail: Bayshoregrouprealty@gmail.com or call 231.633.3672.